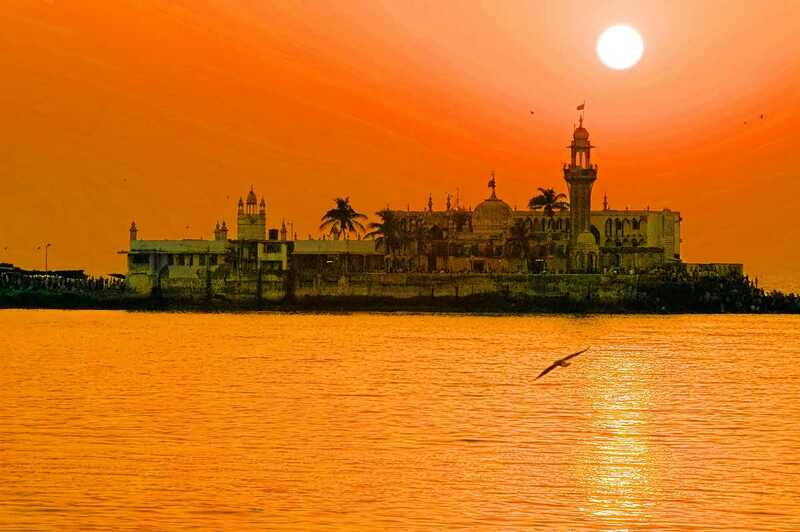 Located in the southern part of Mumbai off the coast of Worli is a famous mosque/dargah called the “Haji Ali Dargah”. This dargah consist of the tomb of a wealthy Muslim merchant known as Sayed Peer Haji Ali Bukhari. It is also renowned for its magnificent Indo-Islamic architecture. Additionally, it is also considered to be the most popular landmark in the “City of dreams” i.e. Mumbai. Important travel information related to this beautiful “Dargah” is as follows. Since this dargah is located off the sea coast it is best to avoid the monsoon season i.e. in between June to August during which high tide is often observed. Otherwise it can be visited anytime throughout the year. b. How to reach Haji Ali Dargah? The nearest railway station to this dargah is located in Mumbai Central. The Mumbai Central Railway Station is well connected to major cities and towns across the country. If you intend to travel by road to Haji Ali the Pune and Navi Mumbai are starting points that are located at close proximity. a. How to reach Haji Ali from Pune : The shortest route to reach Haji Ali from Pune is via Bengaluru – Mumbai Hwy/Mumbai Hwy/Mumbai – Pune Hwy as depicted in the map above. Alternatively, click on the Google Maps link here to view on Google Maps. b.How to reach Haji Ali from Navi Mumbai : The fastest route from Navi Mumbai to Haji Ali is via Bengaluru – Mumbai Hwy/Mumbai Hwy/Mumbai – Pandharpur Rd/Mumbai – Pune Hwy/Sion – Panvel Expyand the route map is depicted above. Alternatively, click on the Google Maps link here to view on Google Maps. The nearest domestic airport to this dargah is located in the suburb of Ville Parle/ Santa Cruz while, the international airport is located in Sahar. Both the international and domestic are well connected to major cities and countries respectively. Apparently this beautiful dargah was constructed in 1431 in honour of a wealthy Muslim merchant called Sayed Peer Haji Ali. According to a popular myth it was during his journey to Mecca having renounced worldly pleasures that Peer Haji Ali died. The body was then put in a casket. It was this casket that miraculously founds its way to the Mumbai shores, and got stuck to a string of rocky islets located just off the shore of Worli. It is on these rocky islets that the dargah was eventually constructed. Click on the link here to check out the places to stay near Haji Ali, Maharashtra on Google Maps.